We have been serving schools by offering our child IDs for over 21 years. Our program can be run at your school as a fundraiser or just as a service to the parents. 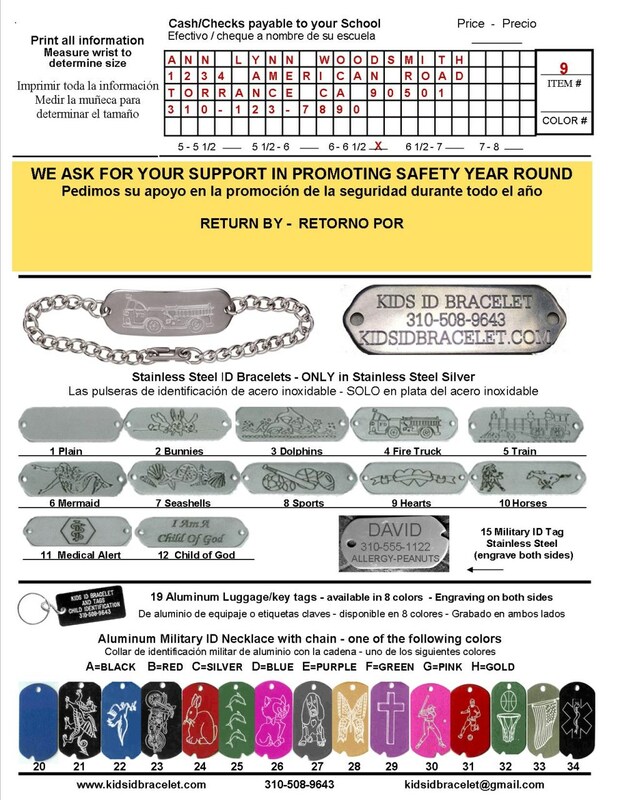 Our ID bracelets come in stainless steel, and our military ID Necklaces, Key Tags and Shoe Tags are available in stainless steel and 8 colors in aluminum. Each item is professionally engraved and we offer over 30 available items. Signs are furnished to post around your school, so you can remind the parents what day the order form needs to be returned back to the school. We work to keep the cost down so parents can afford to participate. Email us at kidsidbracelet@gmail.com the following information and a representative will be back to you. School name, phone, address, number of students, contact persons and email. We will get back to you with a sample of our forms and price list.